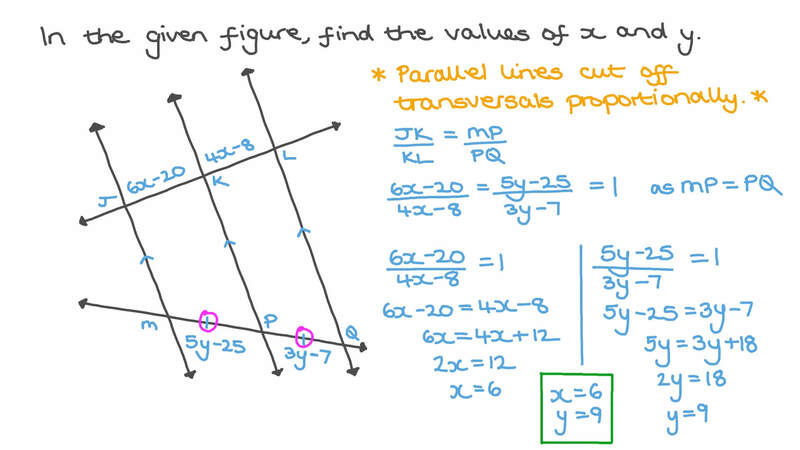 In this lesson, we will learn how to use parallelism of lines to find a missing length of a line segment in a transversal line cut by parallel lines. Using the information in the figure, determine the length of 𝐸 𝐹 . Given that 𝐴 𝐶 = 7 . 5 c m , 𝐵 𝐷 = 1 4 c m , 𝐹 𝑌 = 2 5 . 2 c m , and 𝐹 𝐾 = 4 2 c m , determine the lengths of 𝐶 𝑋 and 𝐷 𝐹 . If 𝐶 𝐸 = ( 𝑥 + 2 ) c m , what is 𝑥 ? Given that 𝐴 𝐷 = 𝑥 c m , 𝐷 𝐵 = 3 0 c m , 𝐵 𝐸 = ( 𝑥 + 7 ) c m , and 𝐸 𝐶 = 1 8 c m , find the value of 𝑥 . In the figure, lines 𝐿 , 𝐿 , 𝐿    , and 𝐿  are all parallel. Given that 𝑋 𝑍 = 1 2 , 𝑍 𝑁 = 8 , 𝐴 𝐵 = 1 0 , and 𝐵 𝐶 = 5 , what is the length of 𝐶 𝐷 ? Find the lengths of 𝐸 𝐶 and 𝐷 𝐵 . Given that 𝐴 𝐵 = 2 4 c m , 𝐴 𝐷 = 3 6 c m , 𝐴 𝐶 = 1 8 c m , and 𝐸 𝑌 = 1 5 c m , find the length of 𝐴 𝐸 and 𝐷 𝑋 . Given the following figure, find the numerical values of 𝑥 and 𝑦 . In the figure, 𝐴 𝐵 = 3 𝑥 , 𝐵 𝐶 = 5 𝑥 , 𝐷 𝐸 = ( 3 𝑥 − 6 ) , and 𝐸 𝐹 = ( 4 𝑥 − 3 ) . Find the value of 𝑥 . In the following figure, 𝐴 𝐵 = ( 5 𝑥 + 4 ) c m , 𝐵 𝐶 = ( 6 𝑥 − 4 ) c m , 𝐷 𝐸 = ( 4 𝑥 − 3 ) c m , and 𝐸 𝐹 = ( 4 𝑦 − 7 ) c m . Find the values of 𝑥 and 𝑦 . Given that 𝐴 𝐵 = ( 2 𝑥 + 4 ) cm, 𝐷 𝐺 = ( 3 𝑥 + 2 ) cm, 𝐴 𝐶 = ( 2 𝑦 + 2 ) cm, 𝐴 𝐺 = 4 c m , and 𝐴 𝐹 = 5 c m , find the lengths of 𝐴 𝐸 and 𝐷 𝐺 . Given that 𝐴 𝐵 = ( 2 𝑥 + 1 ) cm, 𝐵 𝐶 = ( 𝑥 + 3 ) cm, 𝐷 𝐸 = ( 3 𝑥 − 1 ) cm, 𝐸 𝐹 = 𝑦 c m , 𝐺 𝐻 = 1 1 c m , and 𝐻 𝐼 = 1 0 c m , find the values of 𝑥 and 𝑦 . Given that , , and , determine the values of and . In the diagram below, 𝐴 𝐵 = 1 0 , 𝐵 𝐶 = ( 𝑥 + 1 ) , 𝐶 𝐷 = 2 0 , 𝐸 𝐹 = 1 0 , and 𝐹 𝐺 = 1 0 . Find the value of 𝑥 and the length of 𝐺 𝐻 . In the figure, given that 𝐵 𝐶 = 9 4 , what is 𝐵 𝐸 ? Suppose 𝑋 𝑌 and 𝑍 𝐿 intersect at point 𝑀 , and that 𝑋 𝑍 and 𝐿 𝑌 are parallel. If 𝑋 𝑀 = 4 6 , 𝑌 𝑀 = 6 4 , and 𝑍 𝐿 = 1 6 5 , what is 𝑍 𝑀 ? Suppose that, in the figure, 𝐴 𝐶 = 3 0 and 𝑚 ∠ 𝐸 𝐷 𝐵 = 1 3 9 ∘ . What is the length of 𝐴 𝐸 ? Given that 𝑋 𝐿 = 2 3 4 c m , find the length of 𝑋 𝑍 . Given that 𝐸 𝐷 ∥ 𝐶 𝐵 , find the value of 𝑥 . Draw △ 𝐴 𝐵 𝐶 with 𝐴 𝐵 = 8 , 𝑚 ∠ 𝐴 = 3 9 ∘ , and 𝑚 ∠ 𝐵 = 6 8 ∘ . Bisect 𝐴 𝐶 at 𝐷 , and draw ⃖     ⃗ 𝐷 𝐸 parallel to 𝐴 𝐵 and meeting 𝐵 𝐶 at 𝐸 . Find the lengths 𝐵 𝐸 , 𝐶 𝐸 , and 𝐷 𝐸 rounded to one decimal place. Given that 𝐴 𝑌 = 1 6 c m , 𝐷 𝑌 = 2 1 c m , and 𝐴 𝐵 = 8 8 . 5 3 c m , find the perimeter of △ 𝐴 𝐷 𝑌 . Round your answer to two decimal places. 𝑋 , 𝑌 , and 𝑍 are three parallel planes intersected by the two coplanar straight lines 𝐿  and 𝐿  . If 𝐴 𝐵 𝐵 𝐶 = 2 3 , 𝐴 𝐷 = 1 5 c m , and 𝐶 𝐹 = 1 3 c m , find the length of 𝐵 𝐸 .